Hello there! How are you doing? Did you have a nice Halloween? Did you do anything special on the scariest night of the year? We don't really celebrate Halloween here so it was just an ordinary day for us. Now that the spooky holiday is behind us we can concentrate on Christmas. Yay! :D Have you done any Christmas shopping yet? I have already bought some presents, but not all. And for a change I am also on track with my Christmas cards this year - score! I'm about to show you the most recent one I made. This forthnight we have a sletch challenge at The sketchy challenges and the ard I am going to show you was made as inspiration for this challenge. As you can see I decided to make another card in non-traditional colours. The papers I used are from Lawn Fawn and I really like them. 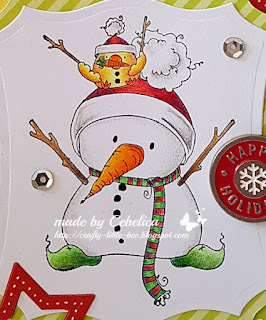 The adorable snowman is a Stamping Bella stamp. I did the colouring with pencils. I embellished the card with some lace, crystals, sequins and "happy holidays" metal charm. I hope you will come play with us. Have a wonderful day! Great card Maja, love the cute image and the bold colours. Drop dead, gorgeous coloring, such a wonderful card. 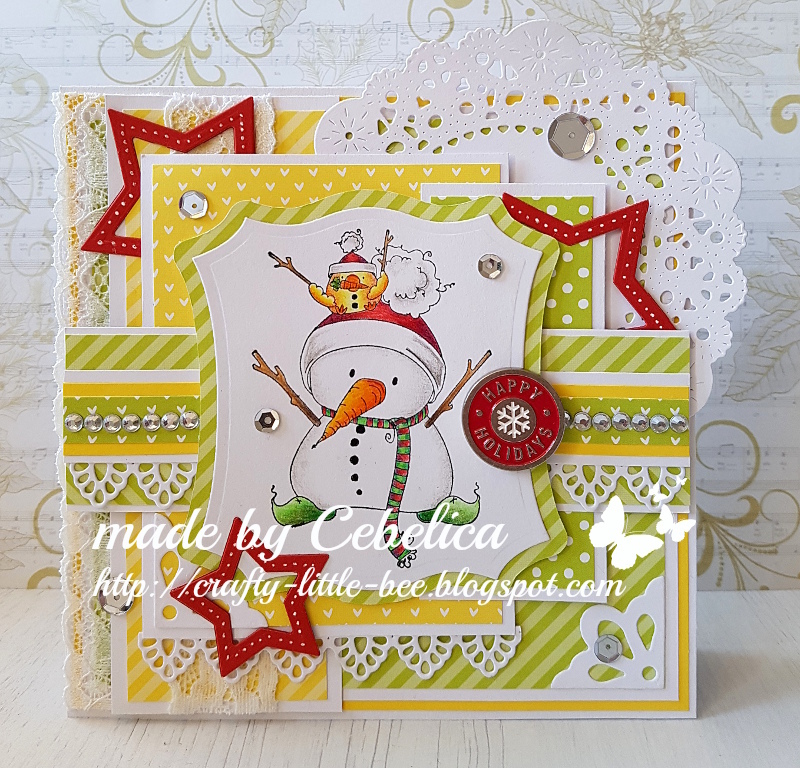 I'm so glad you shared your darling card with us at As You Like It Challenge! vau, prekrasna, prav sijoča v svojih lepih barvah in slojih! Lepa živahna voščilnica. Snežak je pa tako ta ˝glavni˝. An adorable card. Thank you for joining us at One Crazy Stamper this month. This is sooooooo cute!! Love the image, great coloring and I like your non-traditional colors! Thank you for joining us at Noor! Design UK this month for our "Winter" challenge. Hugs!